Coming back for spring semester at Whitman is, well, strange to say the least. For starters, I only got three weeks to re-acclimate to America over Christmas break. Since I stayed in China to travel with my mother after my semester abroad was finished, I actually had less time than other fall study abroad students to get back in the swing of things. Trust me, those extra few weeks make all the difference. I didn’t experience much culture shock when I arrived in China and so I had no idea what to expect when I returned to the US. As it turned out, reverse culture shock hit me like an unexpected hammer. I would find myself falling into China habits without thinking. I would unconsciously turn on my VPN every time I turned on my laptop. I did laundry five days in advance because I was still on my no dryer schedule. I used chopsticks to cook, craved bubble tea (I miss my Coco!) like crazy, and spoken in Chinese to people on the Whitman campus without thinking. Not only did I have to break my China habits (and cravings), but I had to play catch up at Whitman. My semester abroad was the first semester that I had not taken a science class. I am currently taking three of them (biochemistry, genomics, and evolutionary biology), so I definitely feel like I lost a step (or two). I see a lot of people around campus that I don’t recognize, especially in orchestra, and it periodically hits me that I missed quite a lot while I was gone. We all joke about the Whitman bubble but I feel like study abroad is a bubble as well. You are so removed from America, some more than others, and your home college that it’s easy to forget that life moved on without you. New freshmen are already settled, I missed the orchestra playing with Dr. Dodds, and all of a sudden you can rent textbooks at the bookstore. There is so much that changed here at Whitman that I missed that it sometimes feels like I am a freshman all over again. Not that I didn’t miss Whitman while I was away (I did, I promise), but it’s only now that I am back on campus that I see how different things are. However, it took me a while to see the changes in myself. Oh sure, I knew that my Chinese had really improved and that I had learned a lot about Chinese culture and history, but the internal changes were the ones I was blind to. I’ve often thought that it’s easy to see change in others, but it’s hard to see them in yourself. I found that to be true for me upon my return to Whitman. My new view and understanding of China carried over into my everyday life. It wasn’t just that I now know about Xi Jinping’s policies or that I have first hand knowledge Chinese calligraphy; it’s that I think more critically about certain things. Race and ethnicity takes on new meaning for me. I’d never really thought about what being Asian-American meant to me on such a deep level until I was knee deep in a country where hyphenated identity doesn’t exist. Suddenly I was having to explain, and even defend, my identity to everyone I met. As I justified my own identity to almost every Chinese person I met and talked with, I grew into a habit of thoughtfulness. I started thinking about how much of who I am was truly rooted in my view of myself, and how much was simply a reflection of how other people saw me. Although when I really think about it, I suppose I shouldn’t really be surprised. Studying abroad isn’t just about taking classes in a new place or learning about a new culture. It is more than learning another language, making new friends, or even traveling. The truth of study abroad is that it is a test of your personality. You get to see if you can be an adult in a whole new place where everything you know is out of reach. You are on your own and it is scary, crazy, and wonderful all at the same time. You learn things about yourself that you would have never considered while in your comfortable little bubble. I still have no idea what my future holds, and you know what? That’s alright. Having all the answers all the time would make life boring. Life is a series of questions; studying abroad was stepping stone towards finding the next one. Bonus: pictures from my after semester trip with my mother! This entry was posted in Uncategorized on January 28, 2015 by Lila Stange. Food is one of those things that stretches across any boundary, be it time, culture, or perhaps even space. 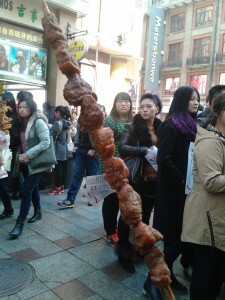 China certainly considers food a crucial part of its culture. Often, food is part of what distinguishes a particular part of China or a certain minority. 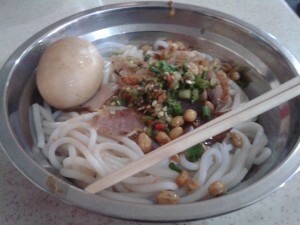 Most every ethnic group, province, and village, has a special food that is very much a part of its identity. Throughout the semester, eating not only became a way to bond with other students, but it was also a key tool for cultural exchange. You don’t need to speak the same language perfectly in order to try the food of another culture. 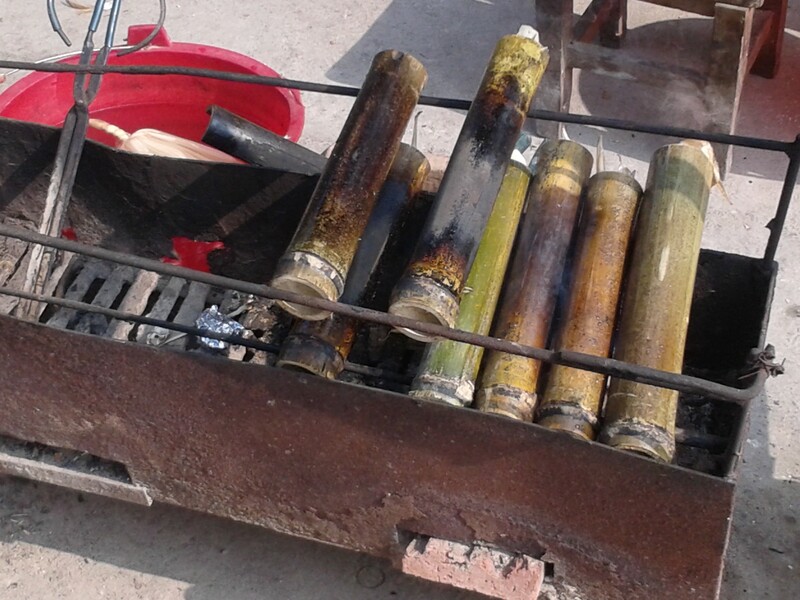 How it tastes, how it is made, and often what it is called can reveal a lot about the culture it comes from. Food is a daily necessity in any country, and as such, by tasting the food from other cultures we can try to understand their day to day lives. In fact, it could even be said that food characterized my semester here in China. When I first arrived, I craved, well what I believed to be Chinese food. I wasn’t looking for fortune cookies or anything; I wanted food such as baozi (steamed dumplings) and jiaozi (boiled dumplings). True to form, the first time we all went out to lunch at a restaurant, I ordered nothing else but baozi and I was quite content. Now don’t get me wrong. Baozi are actually Chinese food (ordered Chengdu style baozi), but they are more like fast food than anything else. They are also eaten for breakfast a lot of the time, but they just weren’t exactly what I imagined. 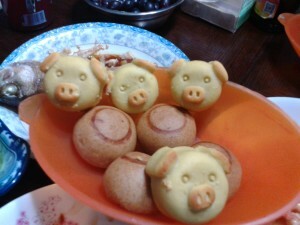 Nor were the moon cakes exactly like what I’d expected. I thought they would be flat, handmade, and have an egg in the middle (to symbolize the full moon). I’d had moon cakes before for Chinese New Year in America and hadn’t liked them much. However, on the day of the Moon Festival with my second homestay family, I was pleasantly surprised to find that their moon cakes were both delicious and adorable. Interestingly enough though, I discovered that almost no one makes them by hand anymore. 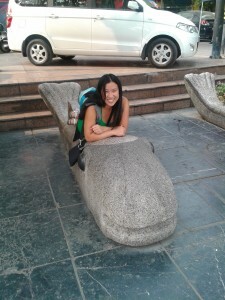 China wasn’t exactly what I expected, but it wasn’t a complete surprise either. As the semester continued, my tastes expanded. 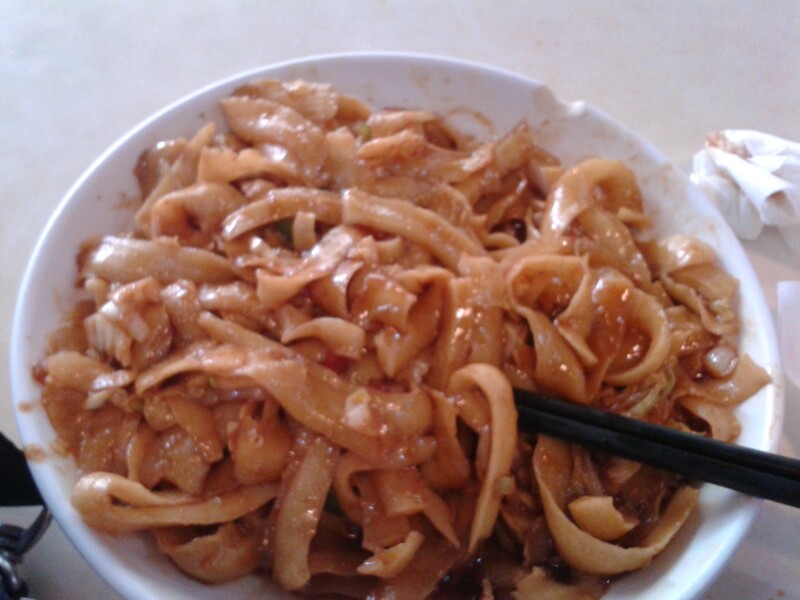 Hand-cut noodles are really really really good. You have to wait a while longer than usual for them, but they are worth the wait. 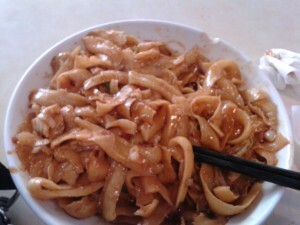 Rice noodles and chaomein are great and all, but the hand-cut noodles are a taste of home-cooked Chinese food. 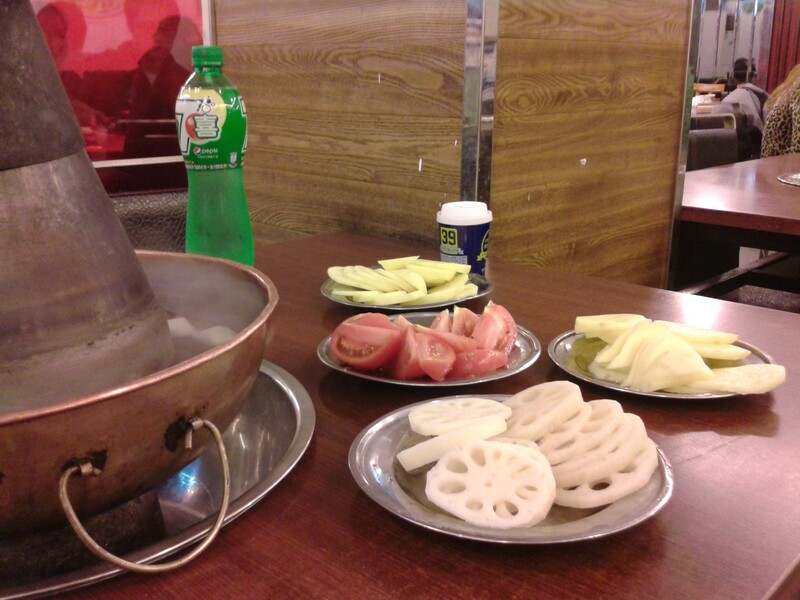 Hot pot is representative of southern cuisine. In Shanghai, we literally had a metal pot with hot coals in the center heating it. You put the raw vegetables, meat, and anything else you want into the boiling broth to cook. Once it is done (everything is sliced thin so it cooks fast), you fish it out and eat it with a variety of sauces. Believe it or not my favorite hot pot restaurant wasn’t the really expensive one in Beijing or the one in Shanghai; it ended up being Xiabu Xiabu, which is a chain individual hot pot restaurant. It has the best curry soup to boil everything in. As I slowly discovered, it is the hole-in-the-wall restaurants and sometimes the “fast food” that have the best tasting food (and it was cheap!). The same turned out to be true of many of my experiences. Going to the “tourist” places like Tiananmen Square was cool and something everyone should do when they are in China, but you feel like, well, a tourist. When we just went out to find a park or a random restaurant, we would end up having the best day possible. One of the (many) times I got lost, I found a street filled with nothing but costume shops for blocks. 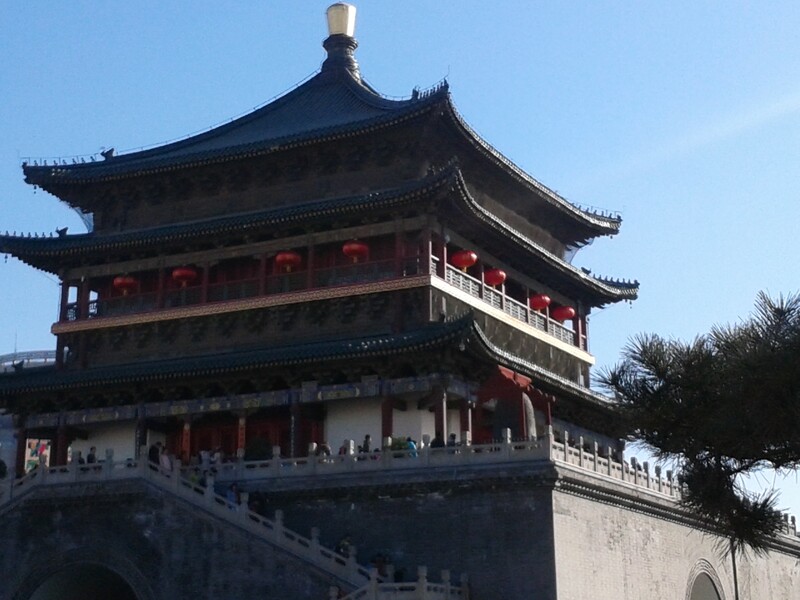 As I got to know and understand Beijing and China, I felt less and less like a tourist and more like I belonged. By the end of the semester, I was eating like a local. We often made a point to try new foods, many of which were local delicacies. If you eat only at the tourist restaurants, you will miss out on some of the best food China has to offer. A good rule of thumb is take your money where the locals go. Chaor (grilled anything with spices) is a must try and it quickly became an IES staple. 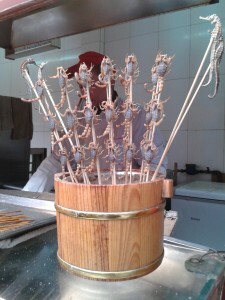 The food wasn’t fancy or expensive; it was what ordinary people eat (though I did not want to try scorpions or sea horses!). We were no longer foreigners. We had become locals. 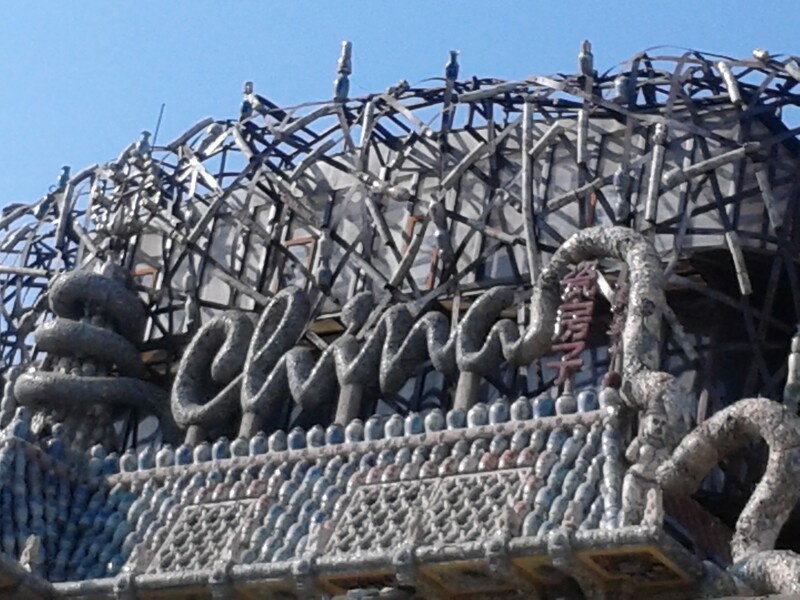 In our little corner of Beijing, we had China wired. Now, by no means am I trying to say that we all totally completely understand China. I could spend ten or twenty years here and still not completely understand it. 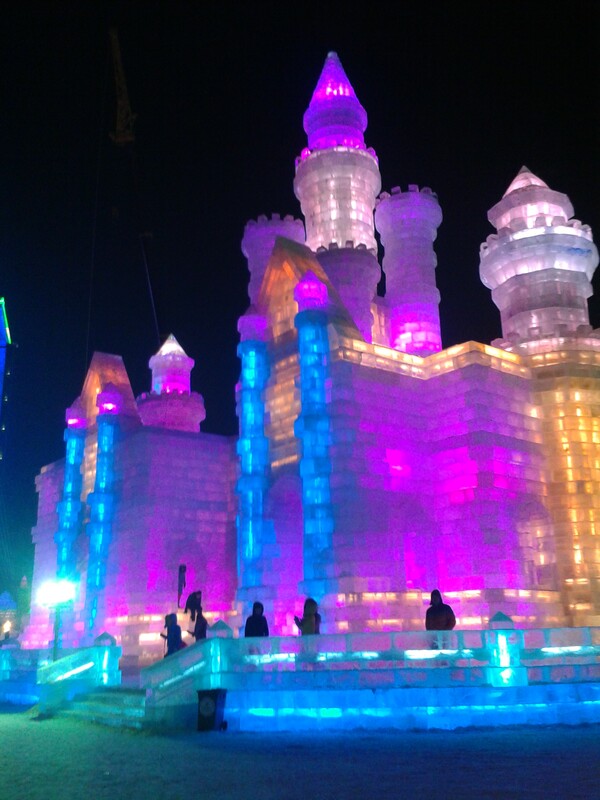 China is a complicated, frustrating, ancient, traditional, modern, exciting, amazing country. There is much more to learn here than just language (or food). China caused my perceptions of not only itself, but also of America, to change. Neither is perfect, but neither is one country or the other fundamentally wrong. There is the American way and the Chinese way. They don’t have to be set against each other. There are more similarities than most people think (such as problems due to majority privilege). 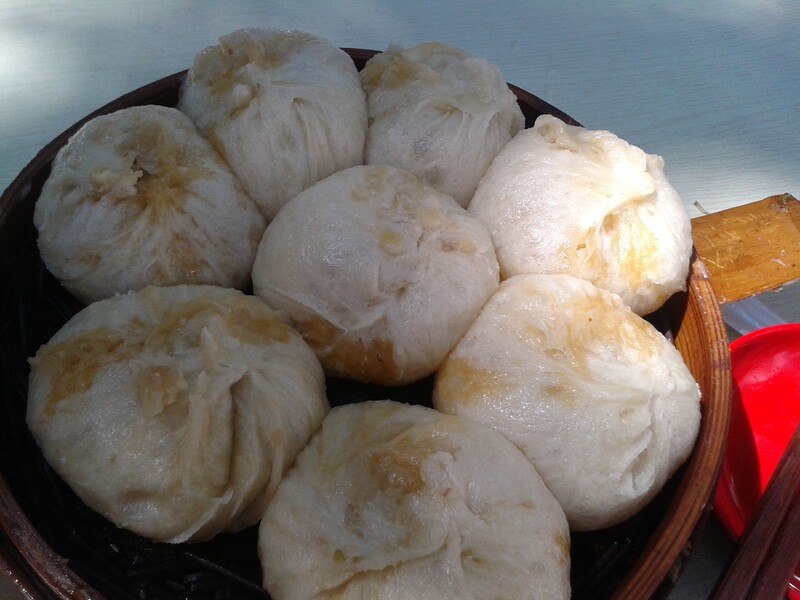 Perhaps if people simply took the time to look past their initial expectations and see the real depth that exists (so in other words, try some chaor rather than having only baozi), they would see the beauty in the differences. After all, having differences and variety is often what make the difference between living and being truly alive. This entry was posted in Uncategorized on December 12, 2014 by Lila Stange. Only a half and hour train ride outside of Beijing lies an amazing city (that almost no one outside of China has ever heard of) called Tianjin. As it is so close to Beijing, I thought it would be just like it. 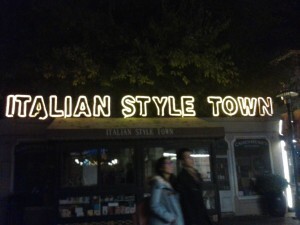 You know, the same types of buildings, architecture, people, food, and so forth. As it turned out, the two cities are extremely different. Can you guess which of the pictures are from Tianjin? It’s hard to be sure, huh? Well, the truth is that they’re all from Tianjin. Without the Chinese characters on buildings and taxi’s, I could have been in any city in Europe. In particular, I felt like I was staying in Greece because our hostel was built to look like a Greek villa (see picture above!). A long time ago it was occupied by many foreign countries at once. All those foreign people (外国人) certainly left their mark on the city. 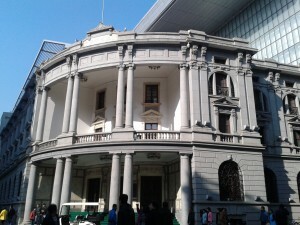 We saw many French style buildings near our hotel and intentionally went to see both the Tianjin eye (sound familiar?) 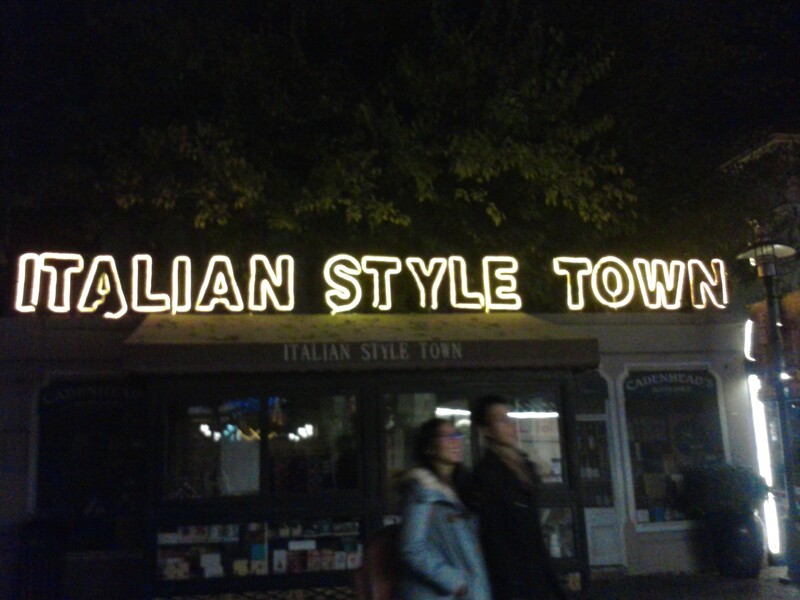 and the Italian Style town. Even the skyscrapers could belong in any American or European city. Despite how foreign the city looked, we only saw a handful of other foreigners. There were a lot of tourists, but they were primarily Chinese. How was that possible? Tianjin was perhaps the most foreign looking city I’d seen in China so far (though I’m reserving my final judgement until after I visit Shanghai). Though, that could be the reason in it of itself. Foreigners don’t often come here because it is so similar to where they come from, and because there aren’t as many business opportunities as in Shanghai or Hong Kong. They don’t know what they are missing. It’s not just a city of foreign buildings either. The people of Tianjin have taken those buildings and made them their own. One of the most well known (and literal) example of this phenomenon is called China House. We found it by accident (of course). 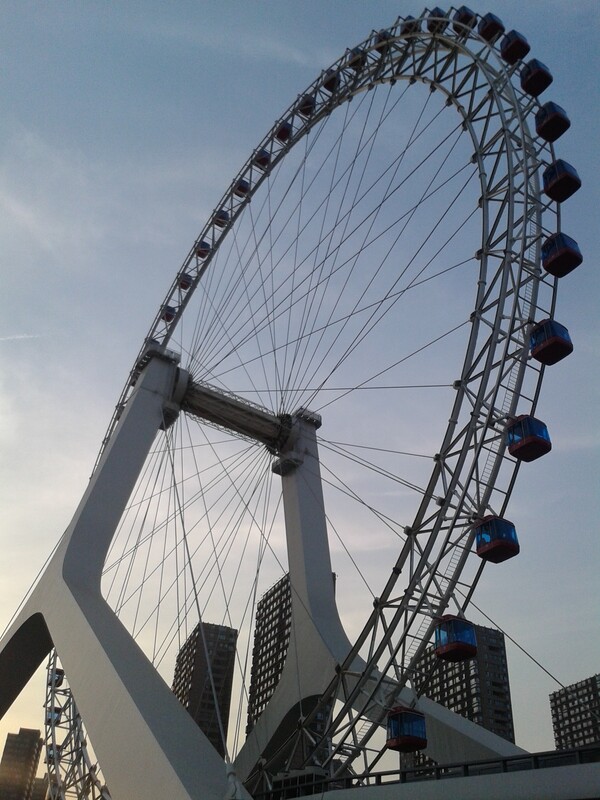 We literally passed it on our taxi ride to our hostel and thought it looked interesting enough to come back to. 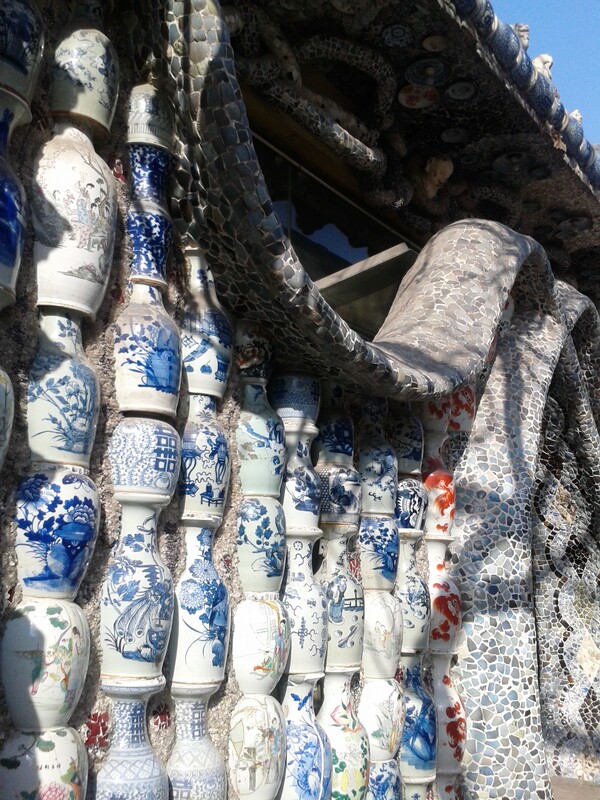 A Chinese man took an old French style building and covered it completely (and I do mean completely) in ancient Chinese porcelain. It is now a porcelain museum that showcases this type of ancient art in a totally innovative way. 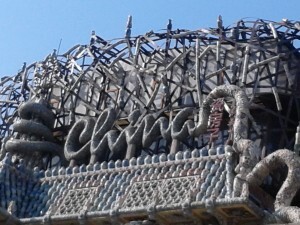 The word “China” in the photo below is made of concrete and covered in artfully broken pieces of porcelain. 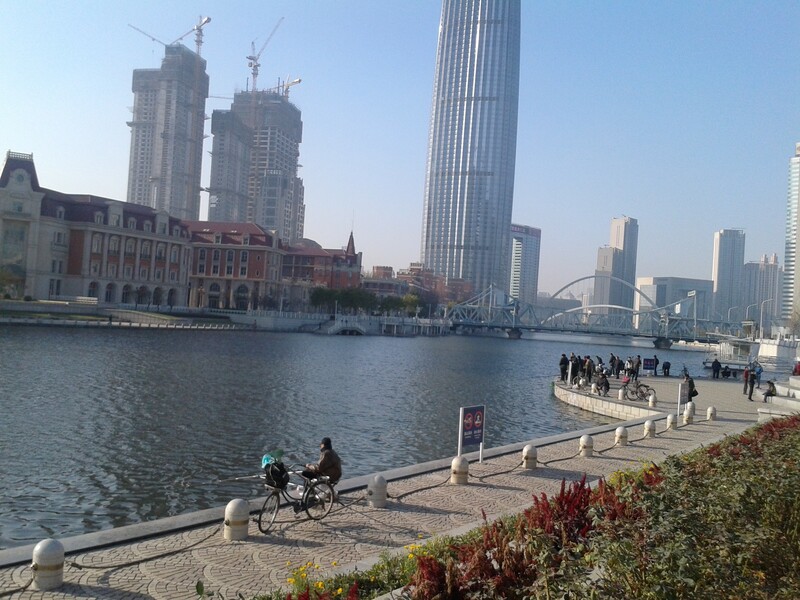 I guess Tianjin is sort of an outward example of how China sees itself today. It wants to be a modern country, but with Chinese characteristics. It’s a daunting challenge faced by many countries and people around the world. How do you advance and better yourself while still maintaining your own essence and culture? 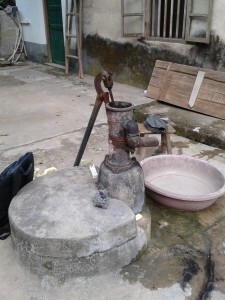 Perhaps China has the right idea; take the old and make it your own. This entry was posted in Uncategorized on November 26, 2014 by Lila Stange. Chinese is not one language. It is actually composed of tons of dialects, with Mandarin being the main one. Mandarin (普通话) is an extremely difficult language; writing, reading, and speaking all come with many challenges that don’t seem to exist (well, for me) in English. Some of the mistakes I make (fairly often to be honest) lead to Chinese people and my teachers not understanding what I’ve said or wrote. Chinese characters (汉字) are very beautiful to look at, but they are often complicated to write. If you forget a dot or a tail, it can be an entirely different character with a whole different meaning. See if you can see the difference in the characters below. Yeah, this is why I have to be very careful when I write characters. If I write 周未 instead of 周末 then I’ve written a nonsense word rather than the word for weekend. I’ve found that writing characters in the proper stroke order helps me remember which characters are which. Stroke order is the order in which you write a character. If you don’t follow the stroke order, the character often looks so strange that even Chinese people will read it wrong. That makes for some awkward misunderstandings on my homework. Then there’s the character that have several different meanings and pronunciations. Most of the time you just have to assume based on context. Take 得 for example. It can mean need or have to (pronounced like “day”) or it can be a grammar structure (pronounced like “duh”). If it follows a pronoun, then it means need or have to; if it follows a verb, then it shows how that verb is done (such as done well, done badly, done fast, etc.). As complicated as the characters are, pronunciation is without a doubt the hardest part of learning Mandarin. In English, the wrong tone can get you in trouble with your parents or teachers, but when you’re in China, the words “watch your tone” take on a whole new meaning. In Mandarin, tones don’t mean the tone of your voice, but the inflection of your voice when you speak. Mandarin has four official tones, but the neutral tone is also used. I count myself lucky actually. Cantonese has seven. Many foreign students can’t hear the difference in tones. This is a huge problem when we speak because the wrong tone can completely change a character’s meaning. It can be harmless and funny (but still embarrassing) or it can be offensive and cause problems. Now that I am in pronunciation class, I’m more aware than ever of how much pronunciation matters. I can know all the characters in the Chinese language but if other people can’t understand what I am saying because I’m saying it wrong, well, then knowing the characters does me no good. Pronunciation is definitely something I have to master, but I’m willing to learn and China itself is a great teacher. Bonus! A song created to show the importance of tones. This entry was posted in Uncategorized on November 8, 2014 by Lila Stange. Every semester, IES organizes a mobile learning trip for each program. We go with our teachers to other places in China besides Beijing and practice Chinese while we are traveling. Since my program has so many people we got two trips to chose from. We could either go to Guangxi province or Guizhou province. Both of them are in the southern part of China and both of them are different than anywhere else in China that I’ve been so far. I chose to go to Guangxi. It looks nothing at all like Beijing as far as the general landscape is concerned. It is greener, has lots of rivers, and has mountains everywhere. The most unique of them are the karats, which is a very unique type of mountain. 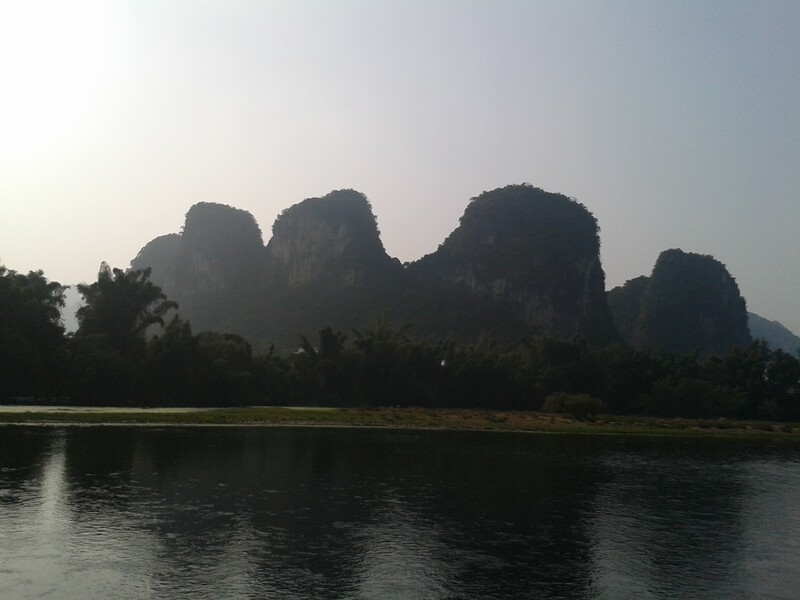 Guilin in particular is famous for them. 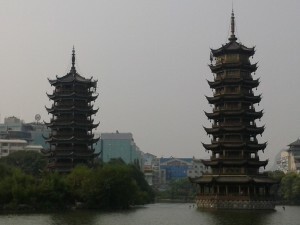 Guilin is tourist city, much like Beijing in that regard, but it is much smaller. We went to see the famous two pagodas on a lake and then tried to go see Elephant Trunk Hill but it was too expensive. And that is about the extent of the “famous” sites there, as opposed to Beijing which has hundreds of famous tourist sites. Nevertheless, the natural sites in Guilin, such as the Lijiang River, are well worth the trip. The water, surprisingly (if you’ve read about China’s rivers in history class that is), was very clear. I could see plants waving on the bottom of the rivers and tiny fish darting around. We even swam in a river in Yangshuo, another city in Guangxi. The locals though we were crazy to do it, but we just waved and smiled at them (well what else do you do in that situation). 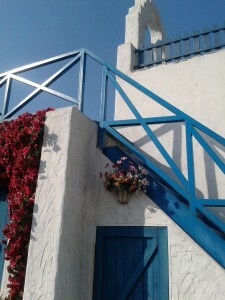 We also stayed in three villages. One was called Longji. 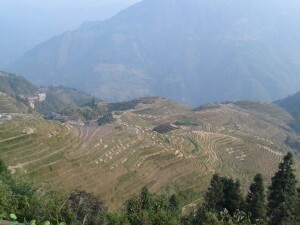 It is particularly famous for its terraced rice fields. If we’d come a few weeks earlier we could have seen them golden and full, but the rice had already been harvested. We did get to see them burning the unused stalks, drying out the raw rice, and prepping the fields for the next season. The people working the fields were primarily minority people. 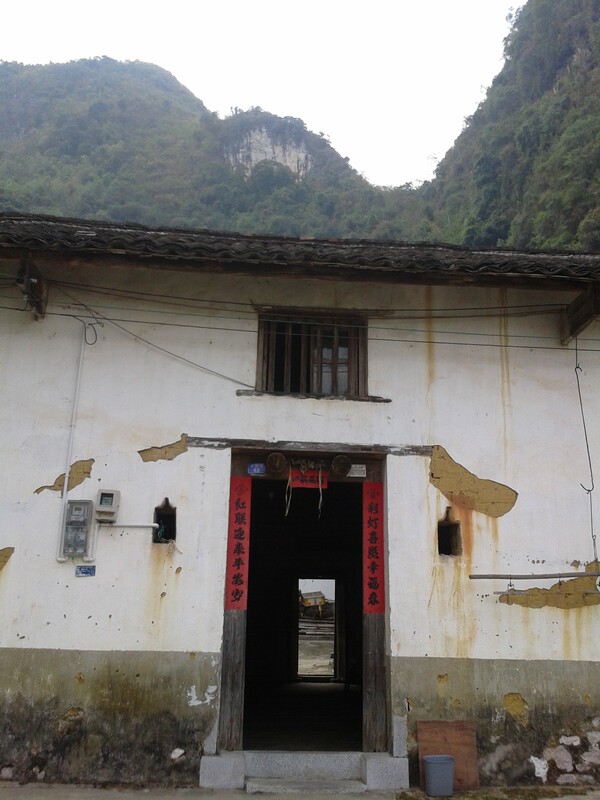 In Longji, they were mostly Zhuang minority. This is the largest minority in Guangxi province. They have their own clothes, food, songs, language, and holidays. Many of these traditions are maintained by the older generation because most of the young people have gone to cities for education or are only learning Mandarin to prepare for a better life. Our second village was about half Zhuang minority and half Yao minority. Yao minority people have their own unique traditions and customs as well. The long hair of the Yao women is particularly famous. 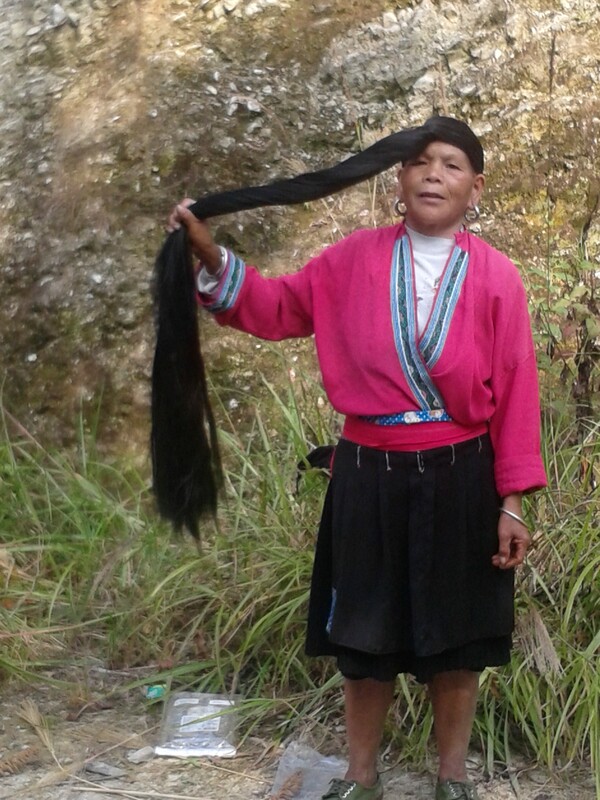 They only cut their hair once a year because they believe that long hair signifies long life. They keep their current hair and last years hair together wrapped around their head for practicality. These women are anything but stay at home moms; on the contrary, they are in quite good shape. They hike up and down the mountains and rice terraces hauling heavy loads on their backs in baskets. Our last village was the most different of them all because it was a farm village. They had traditional houses and very minimal modern technology. If they wanted to eat chicken, they had to kill one. They used old tools to dig up their crops, and so did we when we dug up sweet potatoes during our stay. They don’t have machines to help take their yellow beans out of their pods; they do it by hitting the pods with a large stick. Once they collected all the beans up in a dust pan, we helped them sort the good from the bad by hand. The good ones can be used to make tofu; the bad ones we threw at each other behind each other’s backs. Don’t blame us. The teachers started it. We learned a lot about minority groups and rural people on this trip, but what we also learned a lot about each other. In the natural beauty that is Guangxi we all bonded in a way that would be impossible in Beijing. There’s nothing like digging up sweet potatoes, hiking for six hours through the terraced rice fields, and swimming in a river to bring people together. This entry was posted in Uncategorized on October 27, 2014 by Lila Stange. The desert looks like it should be blazing hot as we pull up to it in our tour bus. To my surprise, the wind is so chilly that quickly reach for my jacket. 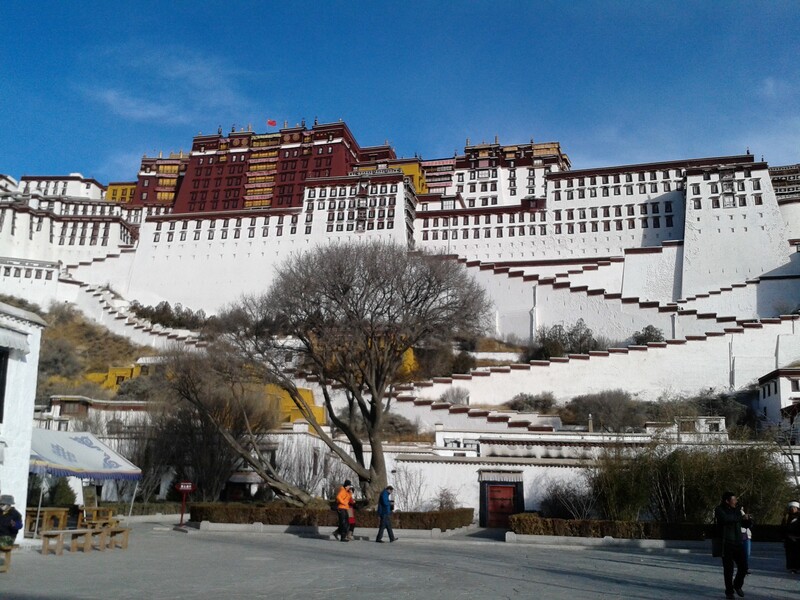 As we approach the ticket office, Rocky, our Mongolian tour guide, tells us that this weekend is one of the last weekends that people can tour Inner Mongolia. It gets so cold after that point that even the Mongolians retreat to the city for warmth. That certainly explains why we had to wait in line for half an hour even to get into the desert by cable car. A tumbleweed rolls past my feet. An autumn breeze swirls my shoulder length hair, cooling it down even as the sun beats down on us all. A particularly strong breeze surrounds us, blowing sand into our eyes and mouths as if to welcome us to the desert. Sunglasses were definitely a good idea today. The temperature isn’t bad either; I’ll take mid 70’s with clear bright blue skies any day. As we pass through a stone gate, I do a double take. 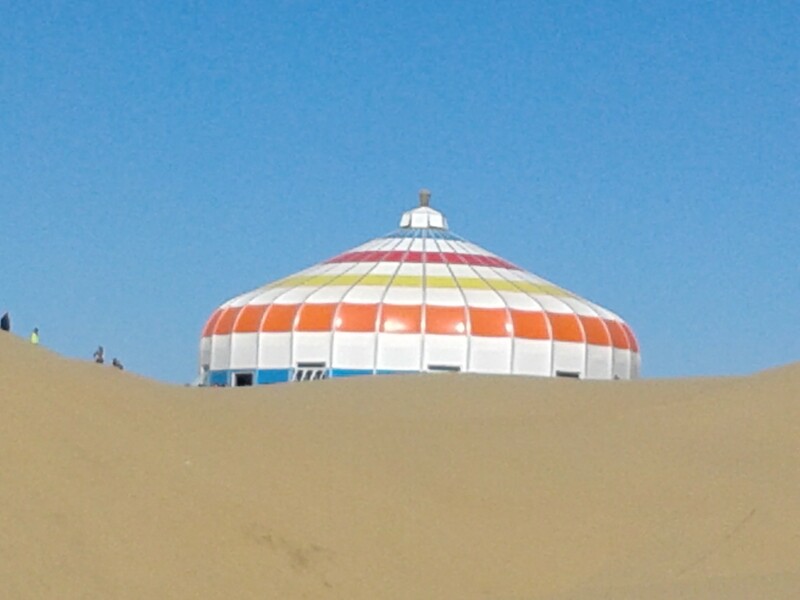 I thought I was coming to see a desert, not an amusement park. I see three very large swimming pools. There are little kids in bumper floaties shaped like animals in one, no one swimming in another, and an adult on a water bicycle in the third. The huge deck around the pools holds about a hundred beach chairs. 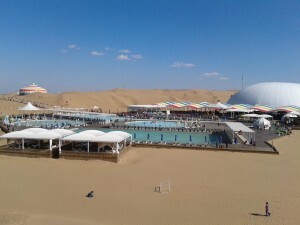 I can tan poolside in the middle of the desert in Inner Mongolia. Huh, who knew? The rest of the space underneath the colored marque is filled by about 15 restaurants and food booths. I can get knock off Burger King in the desert, or I could play sports here as well. There is a basket ball court, three beach volleyball courts, and what they are calling beach soccer, which is basically soccer goals placed in the sand around an area big enough to kick a ball around. It would be kind of cool to say that I played desert volleyball, but unfortunately they don’t have a ball we can just use. I bet you have to pay for it or bring your own. Walking past the strange modern oasis, I see circus looking buildings in the distance. 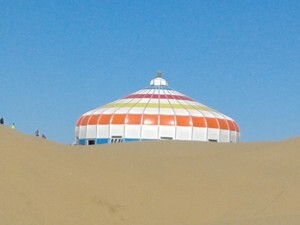 There are also dome shaped bio toilets that look like they should be in a science fiction movie. Apparently “bio toilet” means they use no water. I wonder how that works. It might be environmentally friendly but it doesn’t sound very sanitary. No matter. 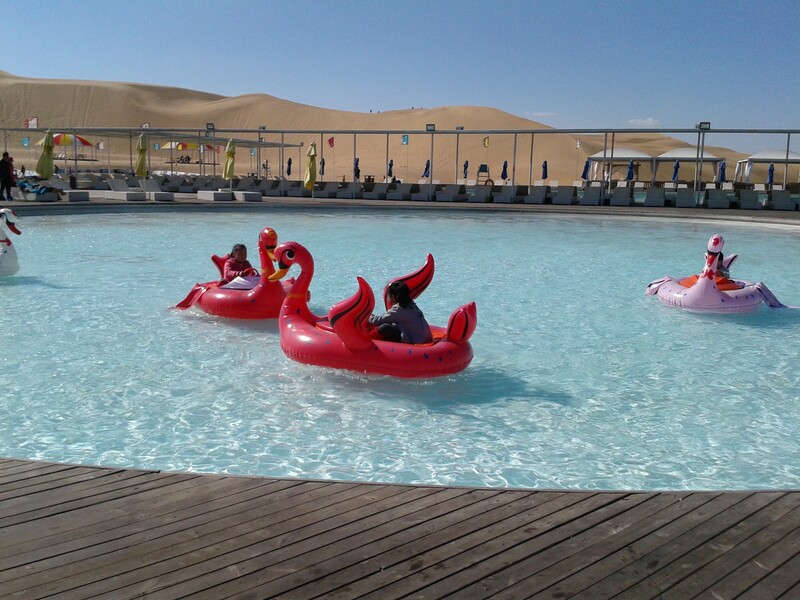 We aren’t here to see the sand, the tumbleweeds, the sand castles, or the bio toilets; we are here to ride camels. Not just any camels – Asian camels. I guess I should explain that. Only camels in Asia have two humps; the camels everywhere else, including Egypt, have one hump. I’m glad for this because the two humps on our camels is helping me stay on. 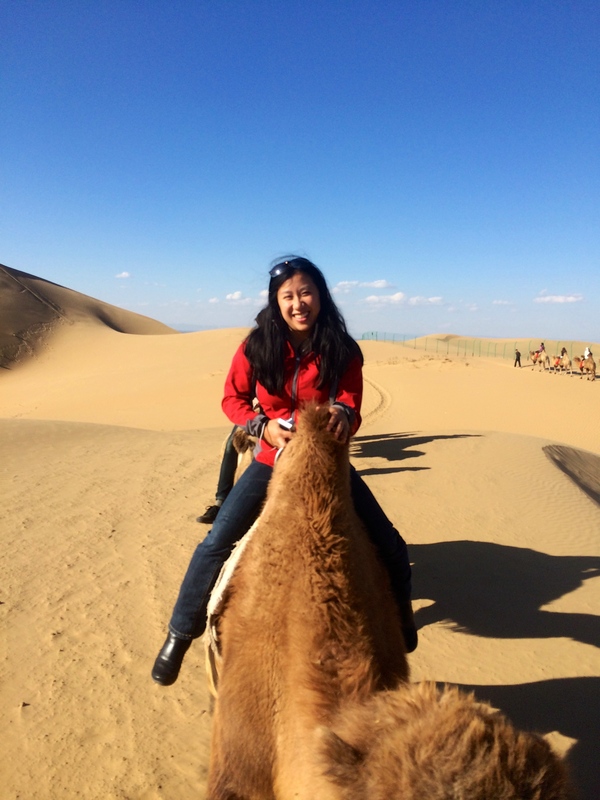 Riding a camel is not really like riding a horse at all. First of all, it’s a smoother ride than a horse so you don’t get saddle sores (though that could have been due to the fact that the camel ride was only like five minutes). Second of all, a camel gets up unevenly. They sit so you can get on their back and then they abruptly stand with their front legs first. This leaves you unbalanced like you are the heavy person on a see-saw. Same thing when you get off. The camel sits down front legs first. I almost got thrown over its head because I leaned forward instead of backwards. 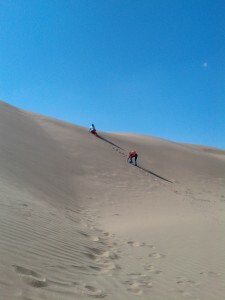 At least a face plant in the sand would have been better than face planting on the grasslands. As we exit the so called “Disney Desert”, I can’t help thinking that it is so different than deserts are in other places. I’ve never seen so much commercialization in a natural landmark like that. In America, when you go to see a mountain or a lake or some other natural site, it is generally pretty, well, natural. 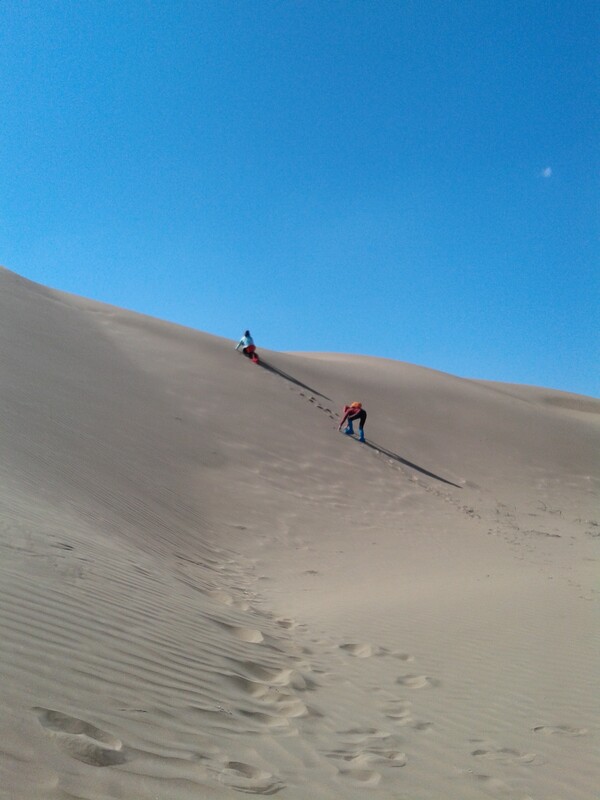 Even our natural parks are less commercialized than the Xiangshawan Desert. I suppose this is just the nature of Chinese tourism. Almost all their famous sites are primarily for tourism; in recent years it has been more about the tourism than the historical or natural significance of places like the Great Wall or the Forbidden City. 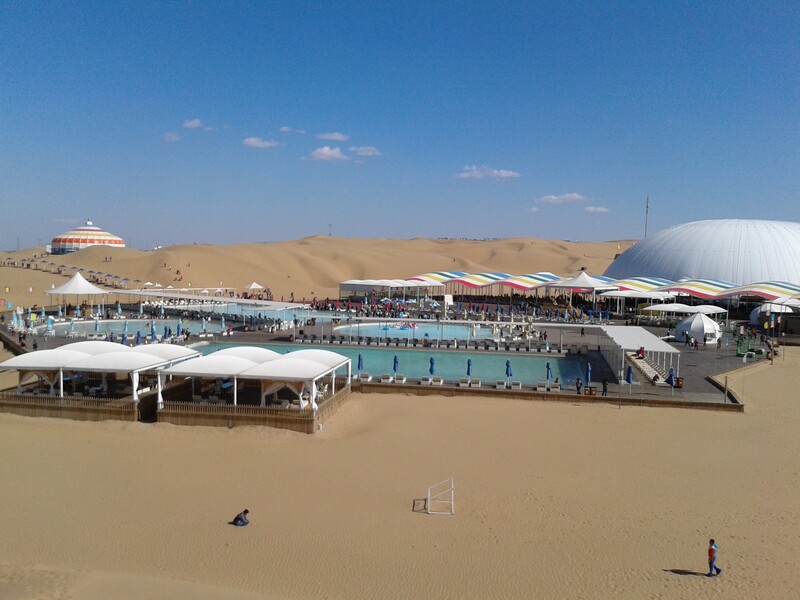 On one hand, it makes me a bit sad that this beautiful desert has been basically turned into a theme park, but on the other hand it is a one of a kind experience that I wouldn’t trade for anything; if nothing else, it makes for a great story and for some unforgettable memories. This entry was posted in Uncategorized on October 11, 2014 by Lila Stange. No one likes to look foolish or lose face in public but here in China they take saving face to a whole new level. They are very concerned with saving face, not only for them but for other people as well. Well, many people tell white lies in America to save face for themselves or others but Chinese people often play the avoidance game rather than face issues head on. For example, if you ask a Chinese person for directions they just point you in the wrong direction or give you false directions rather than saying they don’t know. This is a traditional Chinese way of approaching things so I didn’t really expect it to impact my study abroad life as much as it has. As many of you know, I opted to live in a home stay. The night we met our host parents, we were all gathered in the activity room. We were all whispering our last minute worries, tapping our feet, hugging each other goodbye, pacing a bit, fidgeting with our clothes, and doing a lot of nervous grinning. When my name was called a middle-aged single Chinese woman stood up to claim me. We hugged, introduced ourselves, and then took my luggage out to the car. She had an apartment about a half hour from BeiWai (the Beijing foreign studies university and the school we study at here). I unpacked all my luggage (when did I acquire so much stuff?) and made myself a home away from home. “Excuse me?” I replied in disbelief. “They don’t have a hukou. We have to pull you out of there immediately,” he said. I was speechless. You see, in America anyone can live in an city or state you want to. That’s not the case in China. The hukou system created by Mao restricts the places Chinese people can live. 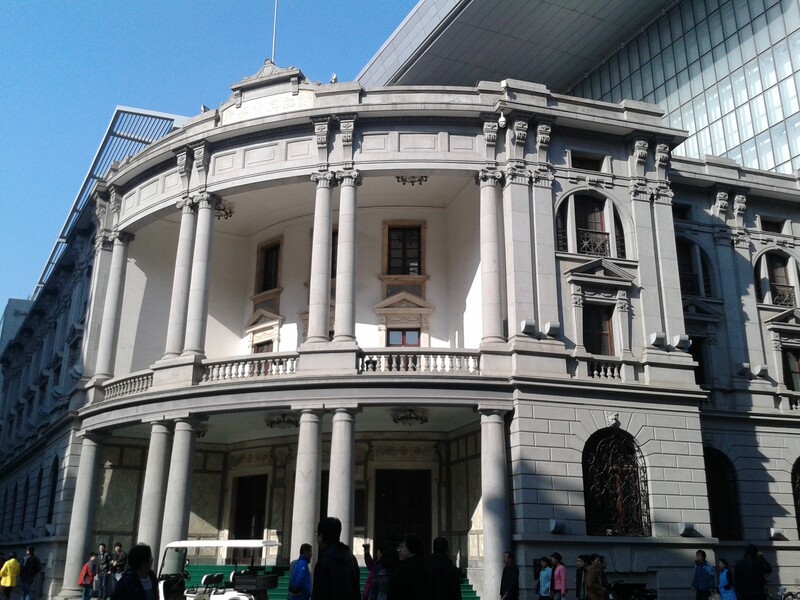 A hukou is basically a residence permit. It registers your place of birth with the local police and labels you either rural or urban. You can only receive free social services in the place where your hukou says you live and if you move to another city you must get a temporary work or residence permit. If you don’t, you are living there illegally. For this reason, I have to register myself at the police station with my host family so the Chinese government knows where I am staying. Since my host family didn’t have Beijing hukou, they couldn’t register me with the police and so I would have been in China illegally. I have no desire whatsoever to be arrested so I moved back to the dorms temporarily. My host mother didn’t talk to me about it. She didn’t want to embarrass me or her by talking it so she just played the avoidance game. I only knew about it because one of our teachers called to talk to her and she (luckily) told him. “Excuse me?” I couldn’t believe it. This had to be the universe telling me I was destined to live in the dorms or something. True to form, my host family didn’t tell me anything about it. They only told my teacher who told the RA who told me. When they saw me packing up my stuff, my host mother actually did explain some of it to me (my host father got a job in America). My host father gave me a phone call and apologized for it. This was the most plain speaking I’ve experience from Chinese people about situations like that. So now I am back in the dorms with a Chinese roommate. As soon as she met me she gave me a huge hug and introduced herself. It was super sweet! We don’t have opposite sleeping schedules so far, we don’t have different living styles, and we have a mutual respect for each other’s space and time. She is more willing than older Chinese people to speak honestly with me on a lot of issues; I’m glad for that. I appreciate straight forwardness to a point. I have high hopes for my current living situation and anyway, third time is the charm, right? Bonus: We hiked to the highest point in the Great Wall! This entry was posted in Uncategorized on September 28, 2014 by Lila Stange. I thought I’d planned for living with a Chinese family. I’d been living in the ASH (Asian Studies House) with Chinese international students, I’d been taking Chinese, and I’d already been to China to visit. I thought I knew what I was getting in to. All my preparation certainly helped prepare me for my Chinese homestay, but nothing could have taken all the surprises out of it. Trying to list them all would be ridiculous so I will try and give a brief overview. Food in China is about as big a deal as it is in France, maybe even more. They will cook wonton soup (with a hard boiled egg) for breakfast, often drink tea in the middle of the day, will juice a fresh watermelon for you just because you are studying, will get up to make you (just me) breakfast at 6 am in the morning, etc. It’s staggering (see picture below for reference). One word of advice though. 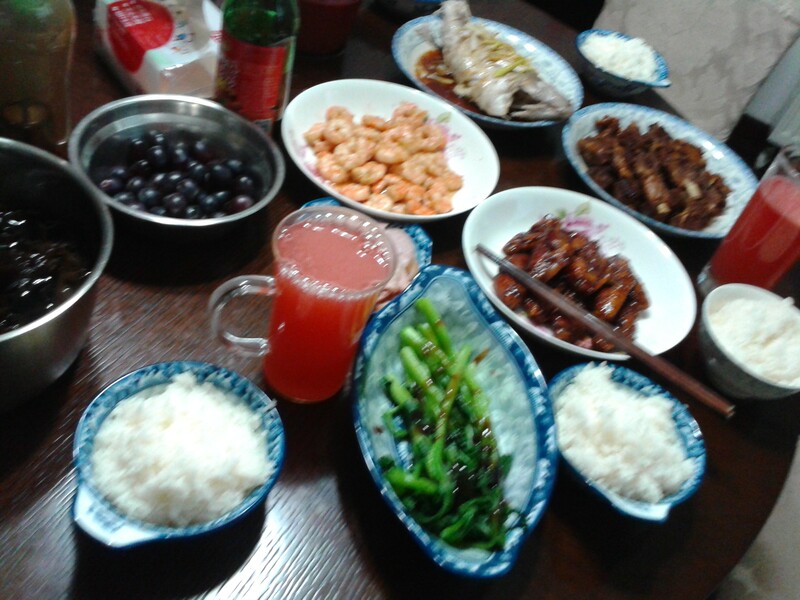 In China, saying “I’m full” in Chinese (wǒ chī bǎo le) does not stop the flow of food. “No, I’ve really eaten enough,” I reply. This exchange repeats two or three times before I take refuge in my room. If I don’t stand firm against them, I will come back to America bigger than I left. Also, did you know that they don’t really talk during dinner? Instead they leave the TV on, and we all watch it together. We’re all too busy eating to speak much anyway. Even so, meal time is family time. I guess the mutual enjoyment of the food is the bonding. Nevertheless, when someone is done eating they can just get up and leave the table. There’s no asking to be excused and no staying until everyone is finished. It took me a while to fall into this habit, as did the habit of using tissues when we eat instead of napkins. It’s not that they don’t work; it’s more that I have to use about three times as many of them. Bare feet in a Chinese home is considered rude and dirty. You must wear pool type sandals in the house all the time. When you shower, you wear shower shoes. There are never shoes out of place because they all get left at the door. I’ll admit that I occasionally forget this, especially right after I wake up. Hey, what can I say? I’m tired in the morning. As for the laundry, the washers are pretty much the same. Dryers, on the other hand, simply don’t exist. Everyone, from old Chinese men to college students, air dries their clothes and linens. Sometimes it takes two days. In the winter I’ve heard it will take even longer. It’s not a problem, as long as you plan ahead and don’t wait to do laundry until you have no clothes. Honestly, the water problems are more troublesome than the air (no matter what the news sites say). I can brush my teeth with the tap water, shower in it, and wash my dishes, but I can’t drink it. You either have to drink boiled water, have a water filter (which my family does), or buy huge water tubs (which IES has). It’s when we go traveling that it’s such a pain. Water may only be about 8 kuai ($1.20) a bottle, but buying them so often adds up. In another vein, on the subway and the bus random people will come up and talk to you. The bus is .4 kuai per ride ($.06), the subway is clean, efficient, and cheap, and there are stalls with amazing street food on practically every block. In the morning, the parks are always filled with people who are doing Tai Chi, playing musical instruments, and working out on the public outdoor exercise equipment. There is always something to see, something to do, someone to talk to, and something delicious to eat. Beijing, and China, are giving me a once in a lifetime experience. I’m not just here to learn Chinese; I’m also here to learn about myself and the culture I come from. It’s like uncovering a part of myself that I never knew existed. 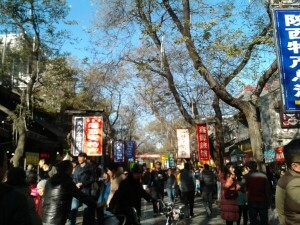 I’ve always known I was Chinese born, but it wasn’t until I got to China this time that I really started understand it. Now I get the chance to see what it would have been like to grow up here. It’s a chance I wouldn’t trade for anything in the world. This entry was posted in Uncategorized on September 17, 2014 by Lila Stange. As I arrived at my departure gate in the Seattle airport, I glanced around and did a double take. 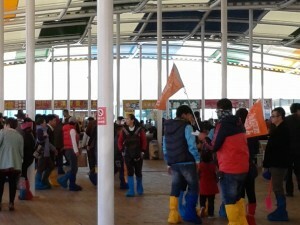 I was almost completely surrounded by Chinese people. The few other Americans who showed up for the flight were being observed fairly closely. I scanned the people nearest to me and realized that I was not drawing the same kind of attention. It puzzled me but in the face of an exhausting 12 hour flight it fell to the back of my mind. Then on one of my first mornings at IES I went out to find an ATM. John, one of the RA’s, had taken me the day before but I, as many people can attest, don’t have a really great sense of direction in places I’ve only been a few times. Needless to say I got really lost but up until I passed the same apartment building three times no one looked at me twice. Old women doing Tai Chi, old men smoking, students buying breakfast, people running in the early morning air and until I started to actually look lost they more or less dismissed my presence. Did I not look American? The last time I was here every Beijing person was able to immediately brand me a foreigner but now I seem to be, well, the norm. They looked at me and saw that I looked like a typical young Chinese college student and then went about their business. I was, for the first time in my life, part of the majority. I’m used to being one of those diverse people in America, primarily by virtue of my ethnicity and looks; in China, I am one of millions of black haired brown eyed Chinese. Even my height is normal. Only my tanned skin is the outward clue to me being a lǎowài (a term for foreigners). Interestingly enough the Asian stereotype from home exists in a similar form here. Because I look Chinese (because I am), every Chinese person I meet thinks I’m a native…until I open my mouth and speak that is. My ability to speak Mandarin well plummets when someone asks me a question that sounds like gibberish to me. “对不起, 我 是 中文 学生. 我 听不懂” (I’m sorry, I’m a Chinese language student. I didn’t understand what you said) I respond. Then they do one of several things: smile knowingly and then start talking about me in Mandarin as if I don’t speak any, look very confused, or give me a disapproving look. They don’t really get the idea of a Chinese looking person who can’t speak perfect Mandarin, or other Chinese dialect. That’s the confusion bit. The other two reactions stem from that Asian stereotype again. As someone who is ethnically Chinese, I am expected to have perfect Chinese and when it is clear that I don’t, they judge me for it. Just like in America, assumptions and expectations are placed upon me based upon nothing but how I look ethnically. So while I don’t get blatantly stared at or get my picture taken by random passing strangers like me American looking friends, I stand out in a different way. I admit it’s a very strange thing to consider. As a result, I made a new goal for myself this trip. By the end of my stay in China, when someone asks me a question thinking I’m a native I will speak well enough that they will still believe it when they walk away. Peter Morrill & Linda Olson on Say what?